A show you’ll immediately hate yet gradually fall in love with, Eric Wesley’s new installation at The Museum of Contemporary Art’s Pacific Design Center has a nasty sense of humor, wit and poetry. Wesley’s installation, Thirty Three Point Three Three Three, is a stage with various odd details: an easy-to-miss replica of a museum column, a unique interactive rotating floor section, an informal video of two people playing in the installation [perhaps instructions? ], a Vespa motorcycle under a camouflaged net hidden in the garden behind the museum, an old Vespa manual on the museum wall and an open museum closet exposing a ladder to the roof of the museum. 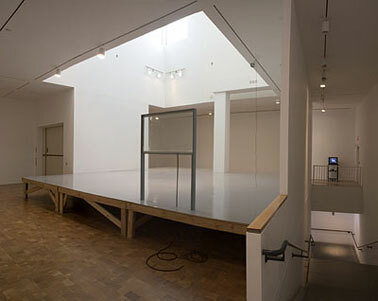 Audience members can walk on the stage and [presumably] climb the museum ladder. These elements have a playful relationship to each other and the museum space: the humor is well disguised, yet forceful. I’m interested to see where Eric Wesley goes from here.